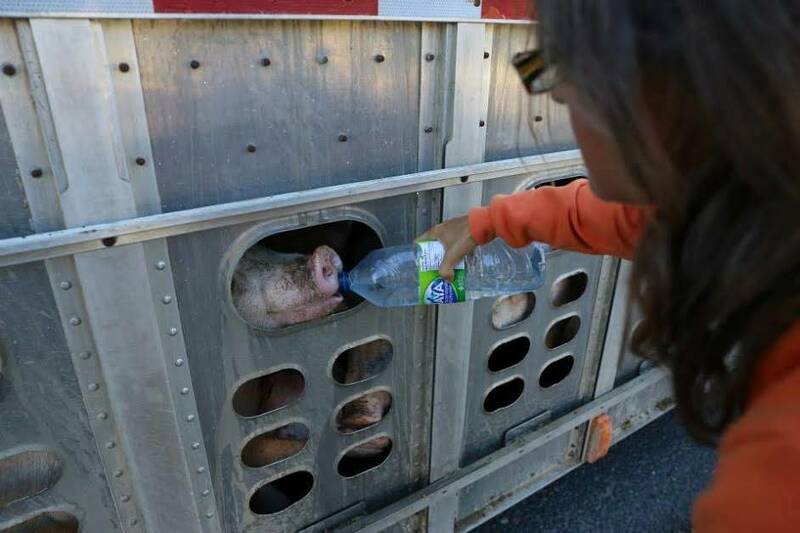 After seeing some of their videos and pictures, it made me so deeply sad and moved, those poor, beautiful animals in sweltering heat without water all packed into the back of a truck. I’m not too proud to say it moved me to tears, the sadness and also the response to the kindness those at TPS showed them. I wanted to be a part of it. I wanted to be one of those people that offered a drink of water, to show some love and to apologise on behalf of my species for the atrocities we commit. I looked for groups in my area and there were none, so I looked for groups in the UK and the nearest ones seemed to be miles away (Essex I think is the closest). So rather than commute to take part in an already established movement, wouldn’t it be better to start a new one in my area? Surely I cant be the only one in south Devon who has seen this and want to take part. But where do I start? I couldn’t just rock up to a slaughterhouse on my own with a banner and some bottles of water. I wouldn’t have much of an impact and, to be honest, this would be a house of murder so don’t really know what to expect. I put a message on a Facebook group for Vegans in my area and had a couple people respond saying they would be interested. It may have only been 2 or 3 people, but it was enough to keep me on track and think it is worthwhile. I have since made contact with Toronto Pig Save and they have offered some advice and even passed on my details to Manchester Pig Save to offer even more. I have made a list of abattoirs and slaughterhouses close to me from Yell.com and tried to scope them out on Google Earth to get my bearings and also identify some points that people could meet and congregate. It is still early days, but it is something I am determined to get started and in full swing. I will be setting up a Facebook group shortly and will come back and put the link in here, if you are interested in taking part or just want to offer support in any way, please join and say hi. It wont happen overnight, but it will happen. The key thing is to create a sustainable group. For that to happen, it needs to be done right. We need to know the legalities and rights we have so we can offer the largest impact we can. The key thing to remember about Vigils is that it is about the animals. Its not an excuse to get violent or destructive, we will be there to offer the animals kindness, water and love. To show them we care for them. We will also be raising awareness of what happens, of how they are transported, their conditions and how they look. Compassion and kindness, two core strengths of Vegans. But don’t think that it is exclusively for vegans to attend. Obviously, the majority will be Vegan or vegetarian, but meat eaters are welcome to see what they contribute to and maybe open their eyes to a new way forward. Most of us were meat eaters at one point, I was one of the worst, not just in diet but attitude so these vigils will be a way to help open others eyes to what their meal choices cause. The group may be called “Pig Save” but they also attend for other animals too. I will keep regular updates coming and if things start taking off rapidly, will set up a standalone website. Check back for updates and get involved if you can. Hi Stephen, Thank you. It has been very effective. 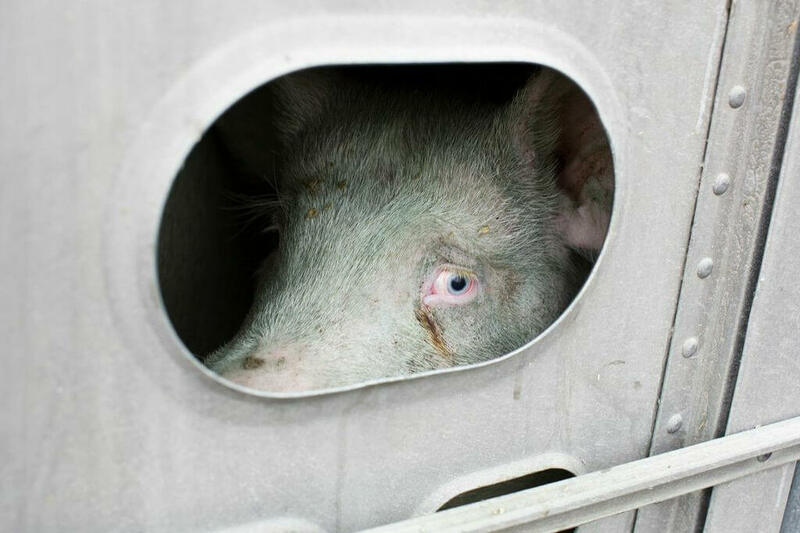 It has helped us show others how these beautiful beings look when they are taken to slaughter. It has helped to break down the disconnect and the footage and experience has created new vegans. It was watching Anita and the others in Toronto which made me want to start it here. It is such a powerful experience and a duty for all to bear witness to suffering. It is such a powerful movement.